I have always enjoyed the Sago. Somehow the pearly, silky, slimy Sagos have captured my attention for a long time. Sago is a starch extracted from the spongy centre of palm stems and is a commercial product. It requires overnight soaking before you could start using it in your dishes. However depending on the quality, I have seen some Sago brands that only requires some 30 mins soak time. In my Amma’s pantry, this is a constant ingredient, always stocked. Though it never found its way to mine. Come to think of it, I realize there are quite some ingredients that I never use that Amma uses a lot. Some because of my own non interest, some because of Athamma and some because the rest of the folks don’t fancy it. So together we have ignored some ingredients from our food chain. So you can imagine the warmth I feel, eating and remembering my childhood days after I eat some of the dishes prepared from the afore mentioned category. I agree life gets interesting in flashbacks as well. Anyway coming to the point, sago is one such ingredient that I get only when a recipe demands. Even then, after using it, I pack it off to Amma. She loves Sago Payasam. I never knew until few years ago that Sagubiyam Payasam has a history in our family. Having said that, you will naturally understand the sentimental attachment Amma has towards this. Hubby dear can’t stand Sago best of times, so I strickly avoid giving him. On the other hand, Athamma loves this, however when one exception strikes, that ingredient never steps in mostly. So we enjoy it when Amma makes the payasam. Amma is also very particular where she buys. She vouches by Nilgris and anything else is never accepted. As I have said Saturdays are Amma’s Vermicelli Payasam as the Prasadam for Lord Venkateswar. She sometimes alternates or includes in that payasam. In the interim, I never realized that Konda is fond of Amma’s payasam. so when we get our share, I happily feed Konda. 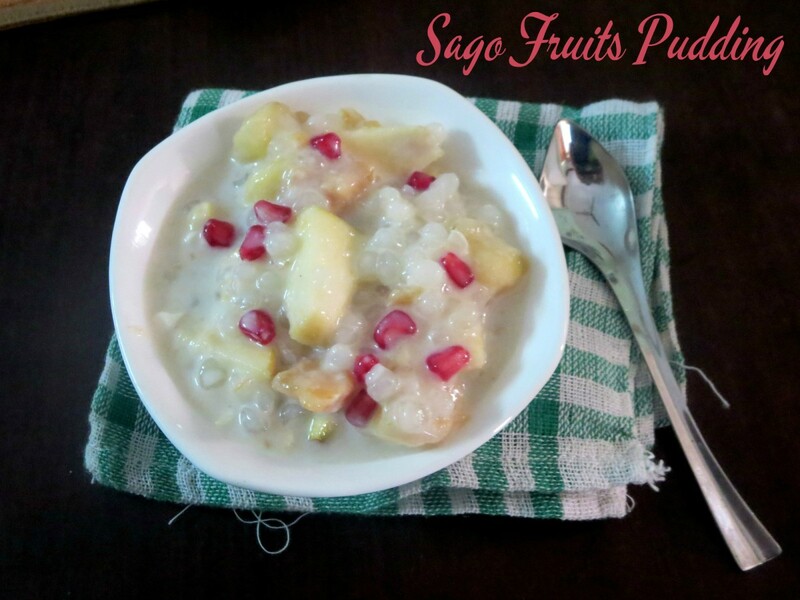 Coming to the recipe for the day, this a fruit payasam, made with Sago and seasonal fruits. You can actually include whatever fruit you like. We added grapes, apples, pears, banana, pomegranate and with vanilla essence, this pudding becomes very exotic! Wash and soak the sago overnight. Change waters and pressure cook with water for 2 whistles. Boil milk and then add sugar and boiled sago. Let it simmer, till it becomes thick and creamy. Allow it to cool and add vanilla essence, refregerate till chill. Mix in your choice of cut friuts and refregerate till serving. This tastes great when served chill. Instead of using milk, you could use condensed milk as well. That will be very easy breezy recipe. Sending this to Harini, who is hosting my Kids Delight event, themed this edition on Fruits in all forms! I too love the pearl like sago, but it always ends up too sticky when I make. Presenting it as pudding will be a better idea for me, I think! Even I don't use sago, though I love sago khichdi, but somehow no one is interested in them in our house too..but the Payasam looks very attractive and so tempting. I have come to love sago kheer as I grew older and that addition of fruits sounds interesting. I love sago kheer.. Addition of fruits definitely adds more taste. Looks yummy. yummy colorful fruit payasam…love it..
Like Rajani said, my sago turns to a mush most of the time, I blame it on the poor quality dago we get here. I remember watching this recipe on a cooking show recently. It sounds perfect as a summer dessert. Looks yum Valli. We love all forms of sago so this always present at home. Only of late I am not making this often due to the starch that FIL has to avoid. 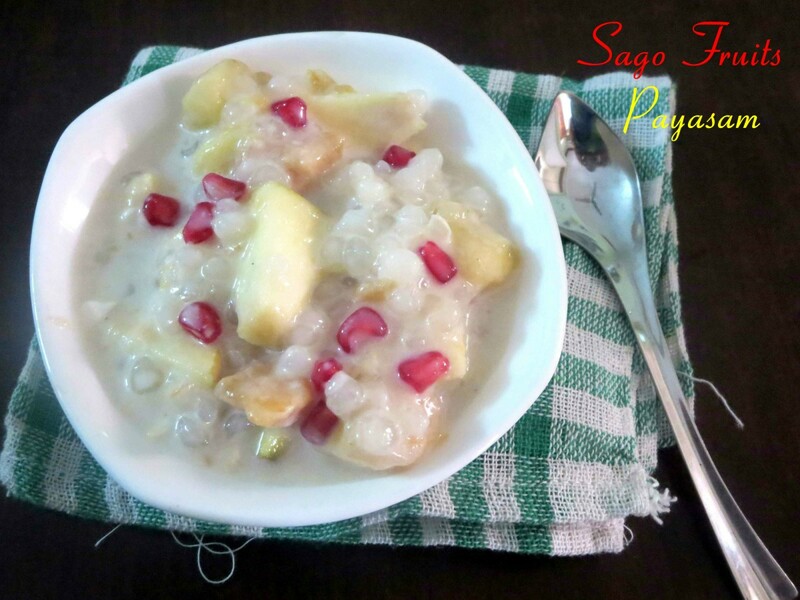 Sago is my favorite for payasam and my mom used to make it for my birthday every year….this is a lovely twist to it. That bowl of sago pudding is torturing me, ultimate Valli.. Interesting addition of fruits in the sago kheer. You have a use a lot of different fruit. I rarely use sago but I have never tried pudding with fruit. Must try it. Nice combo of fruits and sago, looks delicious.